More than three out of every four individuals released from U.S. prisons are re-arrested within five years. 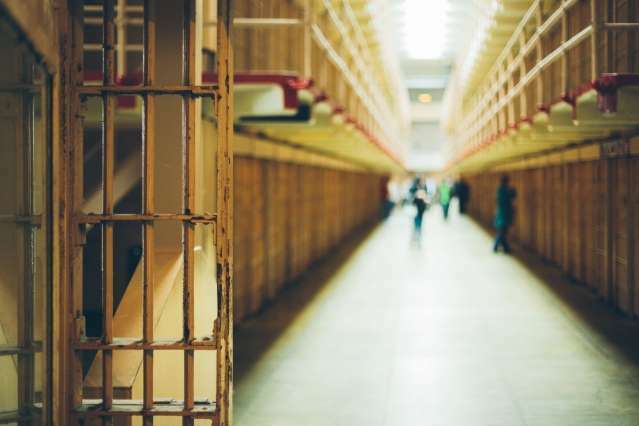 Given the sharp negative effects that incarceration has on individuals and their communities, as well as the often staggering expense of jails and prisons to governments and taxpayers, addressing this "revolving door" has become a top priority for many policymakers. Reentry interventions—programs designed to help people readjust to society following their release from jail and prison—are one promising strategy. Former inmates often face complex challenges after release and experience an increased risk of homelessness, unemployment, addiction, and trauma. Sixty to 75 percent of recently incarcerated individuals were unemployed one year after release, and when they do find employment, former inmates can expect to earn 40 percent less, on average, than they did before going to jail. Seventy to 90 percent of the 10 million people released from jail or prison each year are uninsured, yet this group experiences mental illness, substance use disorders, infectious disease, and chronic health conditions at a rate that is seven times higher than the general population. Difficulty accessing housing, jobs, and treatment services puts this population at a high risk of reoffending, creating a self-perpetuating cycle. The research community has done an extensive amount of work documenting and exploring the challenges faced by formerly incarcerated individuals and the resulting effects on prison populations when those individuals reoffend. However, as policymakers face tough choices about which reentry programs to support with limited funding available, we don't know enough about which approaches work, which work best, and why. J-PAL North America, based within MIT's Department of Economics, is supporting randomized evaluations to rigorously test prisoner reintegration policies and programs so policymakers can direct their efforts in the most effective way possible. Looking at some past examples of research is helping to guide our thinking on what still needs to be tested. In one study, researchers Anthony Braga (Harvard University), Philip Cook (Duke University), Songman Kang (Hanyang University), Jens Ludwig (University of Chicago), and Mallory O'Brien (Medical College of Wisconsin) evaluated the impact of the Milwaukee Safe Streets Prisoner Release Initiative (PRI) on improving employment prospects and reducing recidivism. The PRI provides intensive, comprehensive services—such as vocational and soft-skills training, remedial education, restorative justice circles, substance use treatment, and assistance finding housing, transportation, and employment—to inmates in Milwaukee, Wisconsin, both before and after release with the aim of improving their chance of finding a job and staying out of jail. Within the first year of release, the PRI program increased the likelihood of former inmates finding employment from 55 to 80 percent. However, while the treatment group was more likely to earn an income, their wages were still very low—leaving many in poverty. The PRI program also decreased the likelihood that former inmates would be rearrested (63 versus 72 percent), though there was no discernible difference in recidivism rates. A cognitive behavioral therapy (CBT) program used in the Cook County Juvenile Temporary Detention Center (JTDC) in Chicago, Illinois, offers a potentially more scalable model for policymakers to adopt. The therapy sessions, studied by Sara Heller (University of Pennsylvania), Anuj K. Shah (University of Chicago), Jonathan Guryan (Northwestern University), Jens Ludwig (University of Chicago), Sendhil Mullainathan (Harvard University), and Harold A. Pollack (University of Chicago), generated small but significant and sustained reductions in recidivism at a much lower cost than the PRI. As part of the experiment, trained detention staff led group CBT sessions twice a day for members of the treatment group. The sessions were targeted at reducing impulsive and harmful behaviors that can lead to criminality, and the curriculum was created by surveying other CBT programs and adapting them to the JTDC context based on behavioral science research. This allowed for an extensive understanding of the key elements necessary for successful implementation of CBT in a juvenile detention center. This CBT program helped high-risk youth avoid being readmitted to JTDC after their release. Juveniles who complied with the treatment were 13 percentage points less likely to be readmitted to JTDC than their control counterparts within two months after release, and 16 percentage points less likely after 18 months (an overall 21 percent reduction in readmission to JTDC). While both the CBT program and the PRI intervention proved successful by some measures, the PRI intervention cost about $5,000 per participant, whereas the CBT program cost approximately $60 each. Intensive programs like the PRI may need to have a greater and more sustained impact on recidivism to justify the high cost. On the other hand, investing in cognitive behavioral therapy programs like the one used at JTDC can produce returns ranging from 5-to-1 to 30-to-1 in averted recidivism costs. Governments, service providers, and researchers are continuing to develop innovative projects aimed at finding scalable, effective solutions to close our criminal justice system's revolving door. With support from J-PAL North America made possible by the Robert Wood Johnson Foundation, Jennifer Doleac (University of Virginia) and Benjamin Castleman (University of Virginia) are testing a tablet-based reentry module in two county jails that aims to strengthen inmates' transition back into society. Through this module, inmates create a personalized transition plan prior to release, and after leaving jail receive support and reminders to encourage them to adhere to their plan. If effective, this highly-scalable, technology-based and behavioral-science informed strategy may be a promising tool for successful reentry reforms. With a renewed wave of political attention and practitioner innovation in this space, there is much more to learn about how best to support formerly incarcerated individuals to make communities safer and reduce the burden of the criminal justice system. J-PAL North America invites prospective partners interested in expanding the evidence base on reentry policy to reach out to J-PAL North America's crime sector manager, Ben Struhl, with ideas for evaluations.